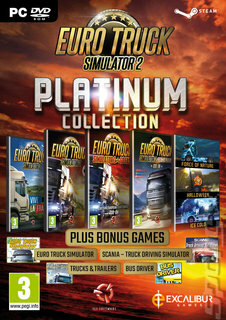 All the Euro Truck Simulator 2 action you could ask for in one small box. A sequel to the hit Euro truck Simulator, in ETS2 you ll be taking on the open road in a dozen different trucking machines across 60 European cities! Be mindful of your fragile cargo keep to your schedule and build up your own truck business! Euro Truck Simulator 2 offers an exciting simulation experience with physics, graphics and gameplay developed by the experienced team at SCS Software, the leading experts in Truck Simulation titles. With over 60 European cities to explore, the in game map is a massive feat that has taken years to create! You ll be responsible for delivering precious cargo from city to city, each time building up your finances that can be used for a great number of investments. You ll be able to upgrade your truck with a selection of different parts including engines, headlights, body kits and much more to improve the performance and look of your truck. On the side-lines you ll also get the chance to manage your own trucking business where you ll need to hire drivers and issue orders for them to complete contracts. Make sure that you are bringing in enough cash to pay everyone and even perform the jobs yourself! Vive la France! is a large map expansion add-on for Euro Truck Simulator 2. Make your way through broad boulevards of industrial cities and narrow streets of rural hamlets. Enjoy French outdoors with its changing landscape and vegetation stretching from north to south. Discover famous landmarks and advanced junctions together with detailed roundabouts whilst transporting and delivering a variety of new cargo for various local companies and further afield across Europe. Go East features 13 new cities. You have access to mile upon mile of eastern European motorways across Poland, the Czech Republic, Hungary and Slovakia complimenting the existing routes through the UK, Belgium, Italy and the Netherlands. Do you have what it takes to enter the world of the long distance HGV driver and deliver your loads on time, every time? Beyond all that, players also get the ETS 2 20 paint jobs add-on, the original Euro Truck Simulator; Trucks and Trailers; Scania Truck Driving Simulator and Bus Driver.